Patatas Bravas are literally fierce potatoes, and these are extra fierce, so not for the chilli-phobic or faint hearted. I unintentionally made these the same day that The Guardian decided to write about them as I'd had them at a friend's the previous weekend and thought them quite delicious. Not my first time, obviously - I've had many versions in restaurants, though mainly La Tasca, so not exactly up to their bravas best. However, like me, my friend likes her food spicy. Very spicy. And this is inspired by her version, right down to roasting the potatoes instead of frying them. Yum! This is the first of three Spanish-themed recipes, so look out for more tapas ideas in the days to come. Chop the potatoes into bitesize chunks, then place in a roasting tray. Drizzle with olive oil, add two cloves of garlic, peeled and chopped into thirds, and a sprig of rosemary, then season with salt and pepper. Toss well so the olive oil and seasoning is evenly distributed, then place in the oven when you switch it on to 200°C. Remove after 5 minutes, shake the potatoes again, and then replace when the oven reaches temperature. Roast for up to 45 minutes, shaking occasionally until the potatoes are crisp and golden. While the potatoes are roasting, make your tomato sauce. Peel the red onion, chop it in half and then slice it, and fry in a little oil until soft. As the onions are frying, thinly slice three chillis, taking care to remove the seeds and add to the onions. Finally, thinly slice the remaining three cloves of garlic and add to the pan. Fry for a further minute, until the garlic is soft then add the cumin and coriander. After 30 seconds, pour in the chopped tomatoes and add the paprika, chilli powder and cayenne pepper. Season with a pinch of salt and a little ground pepper and stir thoroughly. Reduce the sauce over a low heat until almost all the liquid is gone - the slow cooking tempers the initial fierceness of the chilli, and means that it should be ready round about the same time the potatoes are done. 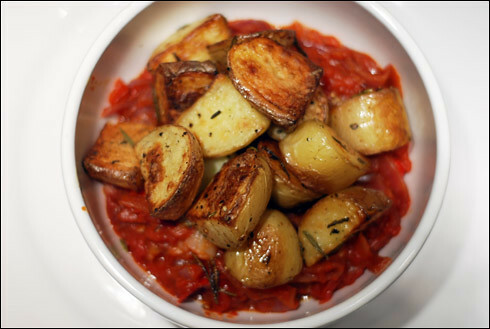 Transfer the tomato sauce to a serving bowl then spoon the potatoes on top. Serve as part of a tapas platter with aioli. I'm looking forward to trying out this one! They look so delicious in that photograph.